Tropics Heating Up? For our part of the world, Hurricane Season comes each summer and fall from June 1 to November 30. But, tropical cyclones show up in many parts of the world and are called different things. Tropical cyclones in the eastern Pacific and North Atlantic are known as Hurricanes. In the Western North Pacific, they gain the moniker of Typhoon. To become a typhoon or hurricane, a tropical cyclone must reach sustained winds of 64 kts or greater which is 74 mph. In the South Pacific and Indian Ocean, they are called Cyclones but only need to reach 34 kts which is equivalent to the Tropical Storm designation in the North Atlantic of 40 mph. If a tropical cyclone forms in the Timor Sea and moves Southeast across Northwest Australia, it is known as a Willy Willy. Now, tropical cyclones have to form away from the equatorial regions…typically north, or south, of 10 degrees latitude. That is because you need coriolis forces to produce circulation and the coriolis force becomes more negligible the closer you get to the equator. Because coriolis parameters are at play and a tropical cyclone is an area of low pressure, the lower levels of the storm flow in a counter-clockwise direction in the Northern Hemisphere and in a clockwise direction in the Southern Hemisphere. The average number of “named storms” in the North Atlantic is about 11 with 5 or 6 becoming Hurricanes. Americans tend to think that active tropical weather is defined solely on what goes on in the North Atlantic but the truth is that the North Atlantic is not even close to the most popular breeding ground for tropical cyclones. This tends to come into play these days when people look at tropical activity to determine the effects of Global Warming. That would be short sighted. The Eastern North Pacific averages 15 tropical cyclones, The North Indian Ocean averages 6 tropical cyclones annually while the South Indian Ocean comes in with 11. The Southwestern Pacific and Australia area checks in with 15 per year but the all time winner every year is the Western North Pacific. That region of the world experiences more than 25 tropical cyclones per year with 18 becoming Typhoons. The season in this hot bed of tropical cyclones is April to December but the frequency of off-season tropical cyclones in this region is much higher than any other part of the world. Until recently, there had never been a tropical cyclone in the South Atlantic until a hurricane (that’s what they decided to call it) showed up off of Brazil in 2004. 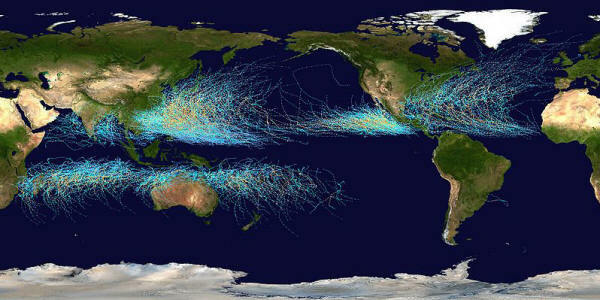 The map at the left shows all tracks of all tropical cyclones from 1985 to 2005. Well, we are coming out of winter in the Northern Hemisphere but they winding up the summer in the South. While it is speculated that the absence of land masses in the Southern Hemisphere is the reason why there are fewer tropical cyclones down South, it stands to reason that, like the Northern Hemisphere, the tail end of the summer months is probably the peak of cyclone season. Right now, there is Tropical Cyclone Ului which is in the Coral Sea and heading toward the Eastern Australian coast according to the Joint Typhoon Warning Center report on Ului . Authorities in New Zealand are also keeping a close eye on Ului. High pressure to the east has weakend and so Ului is moving South but is expected to curve it back to the Southwest as high pressure builds back in once a trof moves through. As long as that happens, it’s the Aussie’s problem, not so much the Kiwis but it is uncertain if the storm makes it all the way to Queensland or just brushes the coast and swings back to New Zealand. By that time, it should be in a weakening stage as it enters colder waters. Well east of Ului is Tomas. Now, Cyclone Tomas approached the Fiji Islands over the past 24 hours and has brought havoc. Fiji has over 300 islands as part of its archpeligo with about 106 inhabited. Vanua Levu is taking the brunt of the storm with winds with Tomas reported at 105 kts with 130 kt gusts by the Joint Typhoon Warning Center. Video from Suva shows the rough seas and gusty winds, though though that city is well away from the center of the storm or its projected path. It serves as testiment to how broad the windfield must be. A report from the New Zealand Herald say there are reports of deaths and damage associated with Tomas with part of Fiji’s 1 million residents hunkering down in shelters. Here is a more complete report that claims that both it and Ului are “fiercer than Katrina” and it’s not too complete because communications are so poor and the storm is moving slowly. The Fiji Meteorological Service has the latest updates and details. Now, this report claims winds have increased to 200 km per hour. That would be 108 kts or 125 mph. That is about the same maximum winds of Katrina, not stronger. And Katrina’s devastation was caused by a storm surge that was enhanced by the local geography. Further, Katrina had winds of 175 mph, or 281 km per hour, less than 24 hours prior to landfall that created a storm surge consistent with a top flight storm. The only reason that the winds decreased at landfall was due to its going through an eyewall replacement cycle. So, that claim is probably an exaggeration. Nevertheless, it’s a tough storm and the surge is apparently an issue. Let us hope that the hyperbole is not the truth and that Fiji escapes. Weather Bottom Line: I still see that upper low coming down from the north on Wednesday but so far, it appears to be content to move down to our west. The question will be how much clouds we have in our area. I still think it will be sufficient to keep us from getting to 60 but, either way, look for a warm up in the coming days. Low to mid 50’s Tuesday with the sun making an appearance. Filtered sun on Wednesday with highs in mid to upper 50’s. Low to mid 60’s on Thursday and Friday then mid 60’s, or maybe even higher on Saturday. Then a cold front brings rain and some t’storms Saturday night and much cooler conditions on Sunday….I think it may be colder than most folks think…I say low to mid 40’s. We’ll see. This entry was posted on Tuesday, March 16th, 2010 at 4:30 am and is filed under Bob Symon, Environment, Global Warming, Louisville Forecast, Louisville Weather, News, Opinion, Science, Tropical Cyclones, tropical weather, Tropics and Weather. Tagged: Australia Cyclone, Brazil hurricane, Cyclone Tomas, Cyclone Ului, Fiji Cyclone, Fiji Typhoon, Global Tropical Cyclone Map 1985 to 2005, Global Tropical Cyclone Tracks 1985 to 2005, Hurricane Catarina, Joint Typhoon Warning Center, New Zealand cyclone, South Atlantic Hurricane, tomas Fiji, Tomas Forecast track, Tomas Satellite, Tomas Vis Sat, Tropical Cyclones, Tropical Precipitable Water Loop, Ului forecast track. You can feed this entry. You can leave a response, or trackback from your own site.